Two shows daily at 1.10pm and at 4pm. 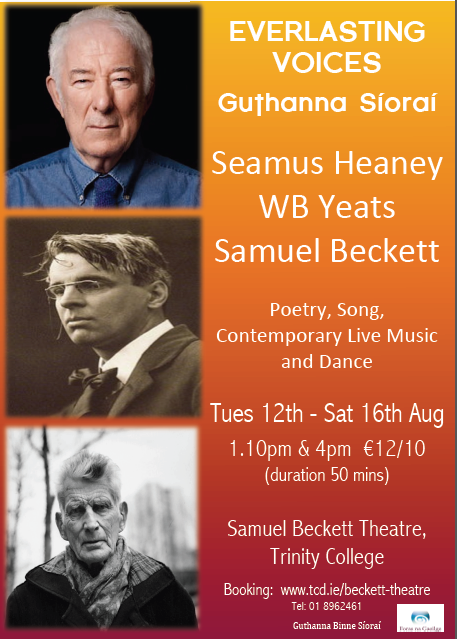 Samuel Beckett, and Seamus Heaney guiding us and charting our journey. interpretation of these four masters, resonating beautifully in the older tongue. familiar to some and new to others. corners of the globe. Their voices transcend all that supposedly separates us. Their voices are truly everlasting. 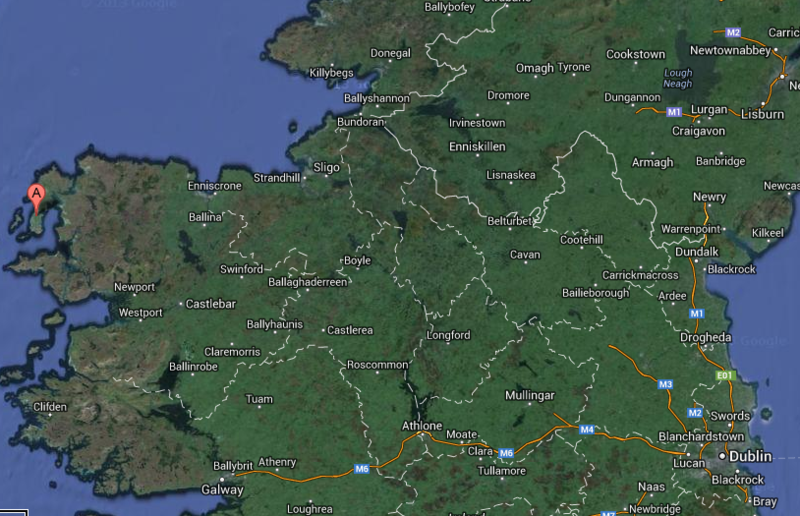 , before it moves to Belfast. ‘The poems come off the page and into people’s hearts, where they belong. It is suitable for all lovers of poetry aged 9-99. ‘Megan Kennedy with her apt and graceful dance’ Shiba Minai, Metro India. A Guthanna Binne Síoraí production. bring these projects fully to life. I’ll be collaborating with Proinsias Mac a’ Bhaird in this interesting line up of 3 poets and 3 guitarists. Dairena Ní Chinnéide and Gearóid Mac Lochlainn are the other poets, while I’m very much looking forward to seeing Steve Cooney and Mark Braidner playing guitar too. Tuile eolas anseo. More info here. Notes: Triúr agus Triúr / Three Poets, Three Guitars Proinsias Mac a’ Bhaird’s poetry is marked by a natural ease of expression, lyricism and sheer fun. He is joined by acclaimed guitarist and singer Enda O’Reilly. Dairena Ní Chinnéide’s poetry is an incantatory fusion of the modern and the ancient. She will be accompanied by guitar supremo Steve Cooney. Gearóid Mac Lochlainn’s latest collection Criss-Cross Mo Chara pulses with musical themes and patterns, and he will be accompanied by ace blues guitarist Mark Braidner. Triúr agus Triúr Ar shaothar Phroinsias Mhic a’ Bhaird tá An Tairiscint agus Idir Beocht agus Beatha. Ina chuid filíochta, téann sé i ngleic le téamaí an ghrá, an bháis agus na beatha. Ina theannta anocht beidh Enda O’Reilly. Tá a guth sainiúil féin ag an bhfile Dairena Ní Chinnéide. Baineann na cnuasaigh An Trodaí, Máthair an Fhiaigh agus Poll na mBabies le pobal agus le tírdhreach a ceantair dhúchais i gCorca Dhuibhne. Más draíochtúil ar an leathanach í is draíochtúla fós beo ar an stáitse í. Beidh an sárghiotáraí Steve Cooney ina teannta chun dánta sa léi a thionlacan. Creideann Gearóid Mac Lochlainn gur ealaín idir chorp agus ghutha atá sa chur i láthair agus thug an Irish Times ‘performance poetry for the 21st century’ ar an léamh a dhéanann sé. Ina theannta anocht beidh Mark Braidner ar an ghiotar. Ag tacú, supporting Rónán ó Snodaigh i bhféile Iorrais, in Belmullet, Mayo way out there on a small peninsula tomorrow. Looking forward to it! I’ll be singing a few songs in Clondalkin Library amongst the poetry by Clondalkin Creative Writing Group. If you’re out that way tar isteach, Come on in. Colm Keegan is an amazing poet and I’m hoping we’ll get a poem outta him on the night too. 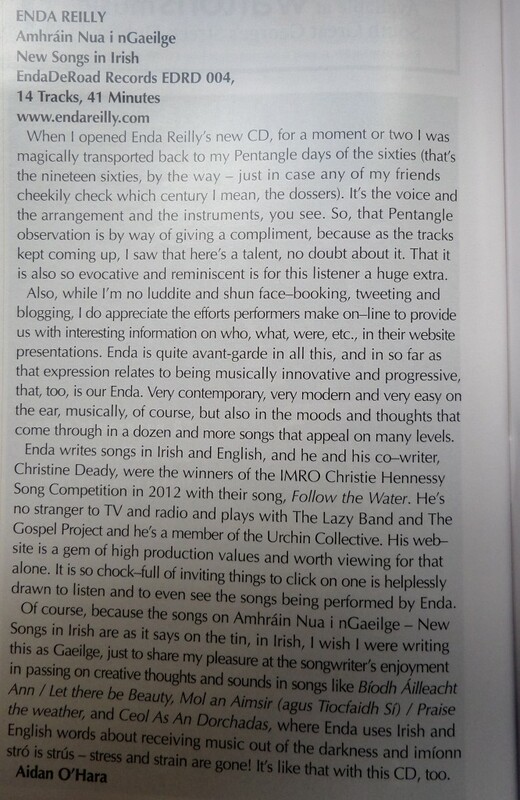 A very nice review of Amhráin Nua i nGaeilge by Irish Music Magazine and a mention of the website which is nice. The album can be bought in all the digital stores like itunes and the CD can be bought direct from me through Celtic Note or CDbaby in the US.